The BJC is involved in ongoing education efforts through developing resources and by leading education programs on Capitol Hill for organizations and churches across the nation. We serve as a trusted resource for clergy and civic leaders on religious liberty and church-state issues. 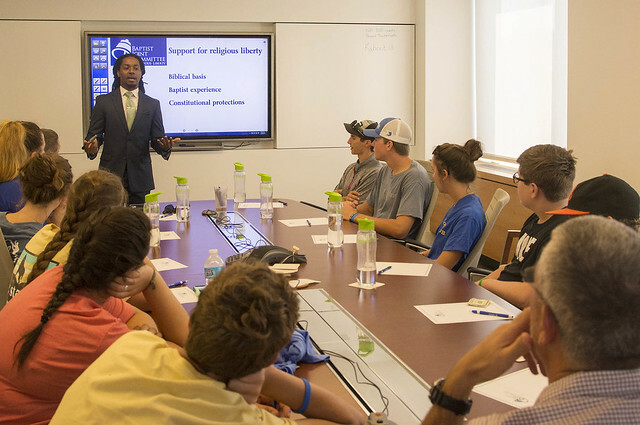 The BJC’s educational efforts engage congressional staffers, think tanks, universities, law schools, seminaries, clergy and church congregations. Our Center for Religious Liberty allows us to host groups in our facility, as well as reach those who are not in the D.C. area through staff member visits and video technology. We encourage you to visit the BJC or bring the BJC to you to learn more about our work on the Hill and how you can get involved. Click here to read why students from the State University of New York (SUNY) come each semester. The BJC offers a host of printed resources for anyone looking to understand religious liberty, and we provide videos and podcasts to provide additional ways to engage with our work and share it with others. We also have an annual essay contest and year-round internship program. Our magazine, Report from the Capital, provides a helpful look at news and opinions on the church-state front. The BJC provides information regularly about specific religious liberty matters, including issue summaries and advocacy guides. To stay on top of the latest news affecting religious liberty, follow our blog and subscribe to our newsletter and email updates. Education is one of our primary focuses because we can’t do it all ourselves. We need colleagues and supporters advocating at the local level. The BJC can go to the Congress, the White House and the Supreme Court with our message, but in the final analysis, it’s the people that decide the issues. Congress votes and justices decide, but they are there because of the votes of the people, and we need a populace educated on religious liberty issues. If you would like more information about the educational programs offered by the Baptist Joint Committee, please contact Charles Watson Jr., the BJC’s Director of Education, at cwatson@BJConline.org. Read about our legislative work. Read about our litigation work.